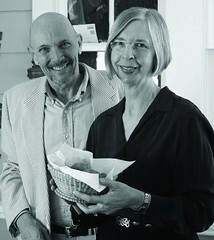 Husband and wife writing team John Shelton Reed and Dale Volberg Reed have penned the instant classic on NC Barbecue–Holy Smoke. And considering they have a Jewish son-in-law and lived in Israel, we welcome them into the fold as honorary BBQ Jews (We’re an inclusive people). BBQ Jew: How many plates of barbecue would you estimate you have you eaten? Dale: We’ve each probably eaten something between 500 and a thousand plates, starting at Turnage’s in Durham in 1961 or so. That works out to – what? – only two or three hundred pounds. John: Not all that much, compared to some folks we know. BBQ Jew: John, when you taught at Hebrew University in Jerusalem, did you find any good barbecue in the Promised Land (perhaps basted with milk and honey)? John: No barbecue, although we occasionally bought pork chops from a Christian Arab butcher who mostly sold to the embassies. Dale: Very occasionally, because they were very expensive. BBQ Jew: What brought you to write Holy Smoke? John: So we sent David a proposal, and the press bought it. Dale: We knew William McKinney when he was a UNC undergraduate and the founder and moving spirit of the Carolina Barbecue Society, and we knew he’d videotaped interviews with some of the great names in North Carolina barbecue, so we got him on board as soon as we could. John: William’s also our whole-hog cooker. The instructions for doing that and for building a pit are his. Me, I cook shoulders, but I’m happy to leave whole-hog cooking to the professionals. BBQ Jew: In researching the book, did you come across any fellow Jews involved in NC BBQ in any way? John: Well, none of the pitmasters or restaurant owners. Actually, though, I think two of the eight guys we listed as Chevaliers du Tasty Swine – champions of the cause — are Jewish. Barry Farber’s a UNC grad who has made a career as a radio talk-show host in New York and who experimented back in the ‘70s with a North Carolina barbecue joint in New York. Dale: He got the real stuff flown in flash-frozen from Fuzzy’s in Madison, but he gave up when he went in one day and found the Greek guys who were running the place serving the barbecue on bagels. John: Alexander Julian’s the other. He’s the big-time New York fashion designer from Chapel Hill who took payment in barbecue for designing the Charlotte Hornets’ uniforms. He gets frozen barbecue shipped to him regularly. Dale: We know a good many Jews in other states who are in the barbecue business, starting with Gershon Weinberg, who used to run the Old Smokehouse Barbecue in Anniston, Alabama, and going on to our buddy Bob Kantor, a Brooklyn guy who runs Memphis Minnie’s, a terrific wood-cooking place on Haight Street in San Francisco. John: You must know the piece by Marcie Cohen Ferris in Cornbread Nation 2 called “We Didn’t Know from Fatback.” It’s got to be the last word on the subject of Jews and barbecue. BBQ Jew: Let’s say Yom Kippur is ending and it’s time to break the fast. BBQ Jews of all stripes are depending on you to recommend the restaurant that serves the most divine swine in the nation. Where do you send them? John: Look, there are a couple of dozen places in North Carolina that we wouldn’t hesitate to recommend. Shoot, there are a half-dozen in Davidson county. On a given day, any one of them might have the best barbecue in the state (which means, of course, the best in the nation). Dale: On a particular day, our advice might be terrible, because any wood-cooking place is going to have good days and bad days. You want one that doesn’t have many bad days and that doesn’t need a good day to cook great barbecue. John: Yeah, if you want uniformity, go to a place that cooks with gas or electricity. You’ll get uniformly mediocre barbecue. At best, uniformly OK.
BBQ Jew: An artful dodge. You guys are good. BBQ Jew: At gunpoint: Eastern or Lexington style? John: This answer’s not going to make anybody happy, but whichever is nearer. You sometimes get the sense that partisans would rather have a second-rate plate of their own style than a first-rate plate of the other. Not us. Dale: If I had to choose between excellent examples of both, I’d probably go with Piedmont-style, because I really, really like “outside brown” and you get more of it with shoulders – especially if you know to ask for it. John: She just says that because her people are German. Dale: We make a big deal in our book about the Teutonic origins of Lexington-style. John: I’d be hard pressed to say. I would have agreed with Dale once. But the more I’ve learned about this, the more I like Eastern-style. In part, that’s because I’m a traditionalist, and Eastern-style is pretty much what barbecue was everywhere in most of the nineteenth century. It carries the weight of all that great history. But there’s more to it than that. A guy named Steve Stephens once said that North Carolina barbecue is “the crack cocaine of pork: succulent, tender, savory and almost impossible to leave unconsumed,” and Lexington-style is like the gateway drug for folks who didn’t grow up with it. The sauce is sweeter, as a rule, it has that tomato tang, and the meat has fewer surprises in it. It may be easier for the uneducated palate to like. But once you’ve come to like the vinegar-based sauces of the Piedmont, you find yourself wanting something more. . . .
BBQ Jew: We’re petitioning the Orthodox Union to create a law pronouncing wood-cooked barbecue is kosher. Would you back that rule change and are there any other general barbecue laws you would like to see? Dale: We’d like to see a ruling that anything rubbed with kosher salt isn’t treyf. BBQ Jew: What’s the most important thing you look for in a barbecue restaurant? Dale: Me, too. We also don’t care (much) about the side dishes or the desserts or the wine list, or even the service. If the barbecue’s mediocre, nothing else matters. If the barbecue’s great, nothing else matters. BBQ Jew: Do you have a barbecue joint pet peeve? Dale: We’ve become fundamentalist about wood-cooking. We’ll allow that some pretty good barbecue can be cooked with hardwood charcoal out of the bag, but out of the burn barrel is better. And fossil fuels should be banned. John: We don’t bother with the gassers, which has saved us a good deal of time and money over the years. BBQ Jew: John, we’ve seen a photo of you in your military uniform from your teaching days at The Citadel. Might there be a photo from Hebrew University of you sporting a yarmulke? 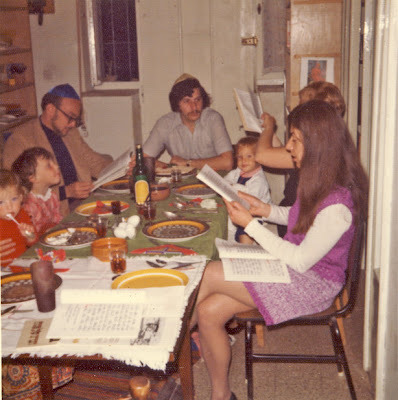 John: Yeah, when in Rome. . . . As a matter of fact, there’s a photo Dale took of me and our kids at the seder we went to in Jerusalem in 1974. I’ll send it to you and you can post it, if you want. That’s our man on the left. Awesome interview. Seriously awesome book, which I was pleased to receive for Christmas (see my own review right here. Great interview with a reminder to BUY the BOOK. I picked it up at the Regulator book shop in Durham and have been gobbling it up. Like the best books of this type (and this one is pretty unique), it’s not just about recipes or reviews. It’s a wonderful social history of NC. What makes it a must-read is that the stories of the best BBQ restaurants is told in the words of the owners…Priceless stuff that is now preserved, in smoke, for posterity. Interesting post, was wondering if you would permit me to link to it in a article i am currently writing for my own website?